A report by The Audience Agency following their work with Art UK to diversify their online audiences, specifically focussing on attracting BAME and 16 - 24 year olds. A programme report exploring ideas around the role of leaders and leadership styles in actively encouraging relationships with diverse audiences. A summary of research into who gives to arts and culture, who has propensity to give and under what circumstances. This report provides an overview of the research undertaken into audiences for the outdoor arts sector (OA) as part of Audience Finder. The Independent Street Arts Network (ISAN) has been our main partner for this work and has acted as an adviser, interpreter and disseminator of the project. This case study details how the Arts Data Impact (ADI) project affected the National Theatre and explores the benefits of a data scientist to a cultural organisation. This case study details how the Arts Data Impact (ADI) project affected English National Opera and explores the benefits of a data scientist to a cultural organisation. This case study explores how the Arts Data Impact (ADI) project affected the Barbican and explores the benefits of a data scientist to a cultural organisation. This case study details how the Arts Data Impact (ADI) project affected The Audience Agency and explores the benefits of a data scientist to a cultural organisation. Showtime was the Greater London Authority's outdoor arts festival as part of the 2012 Cultural Olympiad. This document looks at the findings of qualitative research into the audiences who attended, including changing perceptions of art and culture, how it impacted the area, and whether people would attend similar events in future. This factsheet explains the advice and support that Visit London offers in order to reach more visitors. You'll find links to further free online resources, information about partnership opportunities, marketing and PR campaign ideas, and details of how to get listed on the Visit London website. There's also a handy top tips section for developing cultural tourists. London 2012 was a prime opportunity for engaging with cultural tourists. This factsheet describes the opportunities that were presented during London 2012 for developing a tourist audience - including those with the London Media Centre, Visit London's 2012 marketing strategy, hospitality and hosting, and the overall 2012 culture diary. If you're interested in strategy for targeting cultural tourists you'll find some useful facts and figures in this help-sheet. It contains a wealth of information gathered from various sources including Visit Britain, The London Visitors Survey and the Nations Brand Index. There's links to further resources along with details about decision making influences, sources of information used before and during visits, and the economic impact of cultural tourism. This short but useful glossary provides an explanation of some of the most commonly occurring terms used within the field of cultural tourism. You'll find a list of terminology and definitions - a must for anyone who has cultural tourists as a priority audience group. Results of a pilot shared survey of galleries in the South East, South West, East, East Midlands, London and Wales. This report details the results from a project to increase engagement with the arts and culture among older people in Manchester. The scheme targeted 'gatekeepers' and turned them into ambassadors for culture at 15 venues around the city, including arts centres, theatres, museums and galleries. The Discover Dance programme was run by Arts About Manchester between 2005 and 2009. This evaluation provides Acorn profiles of dance attenders and a useful insight into some of the key barriers to engagement for first time attenders with the dance sector, as well as an evaluation of the development work that was undertaken. An introductory step by step guideline on the marketing research planning process, aimed at those working in arts organisations who have little experience of conducting market research. Big Dance took place throughout the country between 5th and 13th July 2008. It was designed as a biennial celebration of dance, celebrating the diversity, accessibility and fun of the artform. The emphasis was on inviting people to get involved: by creating unusual events in extraordinary places it encouraged sustained engagement and participation by those audiences not typically associated with dance. 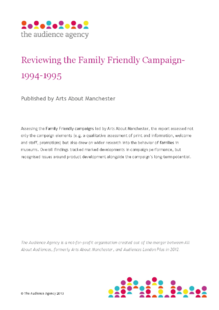 Assessing the Family Friendly campaigns led by Arts About Manchester, the report analysed the campaign elements, e.g. a qualitative assessment of print and information, welcome and staff, and promotions. The Family Friendly campaign developed a tourism element to enable Greater Manchester to develop and strengthen its brand across cultural and leisure sectors within a 2 hour drive time of Manchester. The aim was to attract new UK visiting families, especially short-break takers and day visitors. The Royal Collection attracts 25% of its visits from groups, and shares its insights into what groups want and need, how the market is segmented, trends and group sector opportunities. These sub-groups – including group travel organisers and tour operators – are assessed to reveal a series of top tips. These include the possibilities of combined ticketing, key working partnerships, exploiting trade shows and missions, and testing and programming major shows and new offers and themes. This resource looks at the component elements that can enhance tour booking for dance companies, and in turn build more rewarding relationships with venues and more effective marketing to and engagement with audiences. Recommendations focused on an ever more challenging environment and how to adapt to it, building effective relationships with venues, including working to understand their audiences more, how to share the communications and marketing, engage with advocates and build partnerships with other companies, venues, agencies and across catchments. Snapshot London: Visual Arts, is a visual arts benchmarking project. The Audience Agency undertook a scoping exercise to establish the amount and nature of audience data being collected and used by London contemporary visual arts organisations, and investigated the most appropriate and cost effective means of supporting these organisations in their ongoing audience research and development activities. Findings were put into practice, a framework was produced and a support system provided which enabled a wide range of galleries to collect audience data and contribute to a set of benchmarks. Identifying and interpreting realistic key indicators for performing arts audiences through a collaborative audience analysis and intelligence-sharing programme. Working across 36 London venues, audiences were analysed by artform, demographics and market penetration, repeat attendance, ticket spend and booking behaviour, growth patterns, as well as a propensity to move across venues and artforms, creating robust benchmarks. There's a lot to consider when you invest in externally commissioned research. This useful guide provides a checklist of things to think about, including the different research methods open to you, their uses and limitations and the insight you can expect from primary research. You'll find examples of key considerations and challenges to take into account when commissioning new research, such as costs and timescales, sampling, reliability, statistical confidence and report assessment. This guide provides useful resources and signposting for carrying out effective tour marketing in collaboration with venues. You'll find a checklist of tips - such as sharing the effort between the touring company and the venue - along with online links to other guides such as how to develop a marketing plan when your work is on tour. Cultural organisations are considering the impact that an ageing society will have on the sector. In this useful pack you'll find resources to help you be 'bolder and wiser' in your approaches with this audience. It includes facts and figures, cultural engagement information and a list of potential partner organisations who work with older people. This research snapshot report provides a brief profile of audiences for contemporary dance. It draws on Audiences London and Dance Touring Partnership's analysis of audience data in 2006 and 2007. The key summarised findings conclude that audiences for dance are not as frequent attenders of the artform as we'd like to think, and that the audience profile for dance is similar to audiences for a given venue as a whole. This set of research questions and answer codes was developed during Audiences London's work with a group of London-based visual arts organisations to standardise and share their audience information. They include questions which focus on the profiling of visitors as well as motivation, marketing, behaviour and satisfaction. This guide may be useful to you if the questions correspond to your research objectives and relate to existing practice within your organisation. This helpful guide on undertaking marketing research explains how to successfully and professionally carry out a visitor survey. You'll find information about different types of questionnaire, sampling methods, sample sizes, and how to disseminate a survey. Part 2 here looks at sampling size and methods, as well as how best to disseminate the questionnaires. Part 1 of this helpful guide explains how to design an effective visitor survey. You'll find advice and examples on survey design, how to select questions, what to consider with the wording of those questions and the overall format. Although a visitor survey cannot provide all your research needs, it is a good tool for getting a better understanding of the people coming through your doors and identifying ways in which your service can be improved. It's often difficult to make your story stand out from the crowd. This useful guide explains what you should include on a press release to ensure it grabs the attention of the recipient. It includes a generic template you can use, along with two annotated examples of a press release and photo opportunity. This report provides an overview of learning points from the Enabling Diversity – Greater Manchester project. This initiative sought to develop and provide relevant and sustainable audience development activity with culturally diverse communities in Greater Manchester. The objectives included securing active involvement of member organisations, building market intelligence and delivering marketing activities to specifically targeted communities. Build positive press relationships with help from this introductory guide that takes you through the key stages of a media relations campaign. From finding positive stories to researching media contacts and writing press releases, discover top tips for increasing coverage of your organisation. This research project aimed to bring together all existing data relating to the Visual Arts offer in the Pennine Lancashire area. Collate the information available on existing audiences within the area and those who travel there to consume the visual arts offer. Identify audience development potential in terms of the types, volumes and propensities of key audience groups within the area and map the above to provide: clear recommendations on which audience groups offer greatest potential for development; and how these groups can be most effectively targeted in terms of the product offer, channels and message content. To coincide with the reporting on 'A Night Less Ordinary', the ACE-funded national scheme to increase the numbers of young people attending theatre, this round-up gives brief description of and links to a range of other resources and case studies on the theme of young people’s access to the arts, from 1999 to 2010. Several of them came through the New Audiences for the Arts initiative. The All About Audiences conference in 2011 was framed by the increasing funding crisis in the arts. Arts marketers heard from keynote speakers Ivan Lewis MP (Shadow Secretary of State for Culture, Media & Sport), Mark Robinson (Founder and Director of Thinking Practice). Susan Royce (Change Management Consultant) and Paul Smith (Executive Director of Liverpool Biennial). Their speeches on how to help the arts survive are summarised here. The break-out sessions at All About Audiences’ ‘adapting to survive’ conference in 2011 looked at Adaptive Resilience – and what assets you might have to help you; Designing for Resilience – what organisational structures define a resilient company; Creative Problem Solving- how to release innovative thinking in your team; Collaborative Working – looking at the example of Creativity Works in Pennine Lancashire; Business Models for greater resilience; Fundraising – from your audience, visitors and Friends; Crowdfunding with WeDidThis; and increasing revenue and new income streams. The Audience Agency is a mission-led charity: our purpose is to enable cultural organisations to use our national data to increase their relevance, reach and resilience. The Audience Agency is funded by the Arts Council, as a Sector Support Organisation, to lead on supporting cultural organisations to gain a deeper understanding of current and potential audiences. Resources listed under The Audience Agency also include those produced by the former agencies All About Audiences, Audiences London and Arts About Manchester.